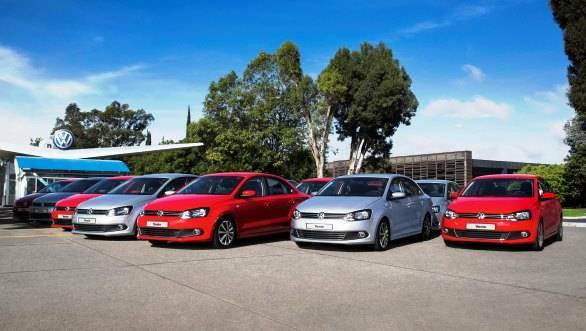 Volkswagen India has announced the commencement of export of the Left-Hand Drive Volkswagen Vento to Mexico. In future, Mexico will become the single largest export market for Volkswagen India with every second car produced for exports at the Pune plant being sold there. After Asia and Africa, the Volkswagen Vento manufactured at Pune, will now be seen in North America. "The Vento was specifically designed and built for Indian customers. However its success in a competitive market like India has opened up doors for exporting this car to various other markets. With the increase in exports of fully built cars, Volkswagen India can tackle the volatilities in the domestic automotive market and in the currency. However, despite the increasing export volumes, the primary focus for Volkswagen India will continue to be on the domestic Indian market," said Mahesh Kodumudi, MD, Volkswagen India Pvt. Ltd.
Volkswagen India commenced exports from India in 2011, first South Africa and then entered the Left-Hand Drive market in 2012 with exports to Middle East. The production of LHD Ventos for Mexico has commenced and the first lot of cars has reached dealerships. The official market introduction of this model in Mexico will be in the beginning of November 2013. The Vento will be offered in the Mexican market with three engine options. "Export to Mexico is the second major step for us in 2013 after having commenced the export of parts and components to Malaysia earlier this year in April. We, at the Pune Plant, are ready to ramp-up production of the Vento to meet the growing demands of our export markets," said Andreas Lauenroth, executive director, Volkswagen India Pvt. Ltd.